Im a Fan of Sit Means Sit Southern Raleigh... Are you? Fill in the below form and you can recommend ‘Sit Means Sit Southern Raleigh’ to a friend or family member via a text message. Show your support with a quick share of ‘Sit Means Sit Southern Raleigh’. Love the team and the quality of training the dogs receive! They provide you with results! Amazing results. Best dog training experience ever. Sit Means Sit was THE best decision for my little girl. She was a hellion and is now a very active therapy dog all thanks to training. I would do it again in a heart beat. I have a better understanding of my dog because of Sit Means Sit. They are well worth the money! Great people and training. They offer a free evaluation and the staff is very professional. Sit Means Sit changed me and my dogs life! For what you get Sit Means Sit is the most affordable training anywhere around. Their service and support can’t be matched! Best dog training around…hands down! Great trainers and always helpful when I have questions. Sit Means Sit provides great results with all types of dogs! Sit Means Sit, checkout the videos, the dogs tell the best story! I am a little bias because he is my son but I have seen the results first hand. He and his trainers are experts at what they do and their knowledge. Kudos Sit Means Sit Southern Raleigh! We got a puppy to be a service dog to our son, and knew we would need help. And wow did they. Michael started working with us when Lola was 12 weeks old, and she did fabulous. She is 5 months old now and, still a hyper puppy, but we can go on walks, have people come in our house without being jumped all over, and she listens. I highly recommend Sit Means Sit!! Our one year old golden retriever did the 15 day training program and we couldn’t be happier with the results. Our private sessions after that with Annie were amazing and yesterday we went for the first time to the group class and had the opportunity to work with Michael. Their training, care and patience for all the dogs they train is incredible. My high energy puppy went from crazy – jumping on people and nipping at us, biting the furniture, etc. to the most lovable pet you can have. She listens to us now and has learned how to be patient and wait for our commands. I highly recommend their training program. It is totally worth every penny. What I also love about it is that we can continue to bring our dog to the group classes for support and reinforcement of everything she was taught. Best training program I have ever seen and experienced. We tried with 3 different trainers before Sit Means Sit – Southern Raleigh and nothing worked. This facility and group of people are simply the best! Sit Means Sit was life changing for me. I had 3 dogs 1 was very reactive to people. We couldn’t take him anywhere or have people over without containing him. Our other 2 we thought where pretty good. After training our problem child with Sit Means Sit, we realized how much better our other 2 could be and trailed them as well. Call is happy, confident, satisfied owners with happy, confident, obedient pups! We worked with Michael to help train our border collie/beagle mix puppy, Toby. It was amazing to watch the interaction and how easily Toby picked up on the training. And then to see Michael’s own dog perform a few tricks really blew our mind. I would definitely recommend this program to anyone! A few years ago we found a stray husky (Sooka) and decided to have him become a part of our family. Sooka was very loving to people but not to other dogs. He attacked our other male dog on a couple of occasions without provocation. The final straw was when Sooka attacked our neighbor’s dog. We knew in order to keep Sooka we needed help. Help was what we got when we hired Michael. With his guidance, expertise, and compassion for our situation Michael was able to help turn our once aggressive husky into a well mannered pet. He taught us how to manage our dog instead of the dog managing us. Sit Means Sit Southern Raleigh is the reason we were able to keep our dog. I highly recommend Michael and his company. We are truly grateful for helping us have the wonderful dog we have today! Michael is easy to schedule an appointment with, and his results are incredible. He’s a patient trainer and a great teacher – both for dogs and their owners! Michael took my unruly Lab and showed me how to get her to focus and listen so I could keep training her on my own. She is a Lab so still a bit of a dork but when I remind her we are training she sits, listens and responds. This training method is the best. Our miniature schnauzer refused to listen while outside. This caused constant stress because she always gravitated to the road. Michael taught her to focus and listen. With a little change in our behavior she now is safe and we are stress free. We owe Sit Means Sit Southern Raleigh a debt of gratitude. Their trainers are patient, kind and trustworthy. 5 stars is not enough! 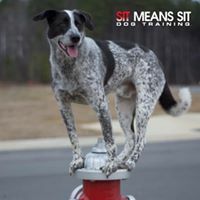 Sit Means Sit: Southern Raleigh is the best place to train your dog. My Pit mix had aggression and confidence issues from the time he was a puppy. I took him to multiple different training classes, from the big name pet stores to local family trainers, and while he made progress, he still had aggression, particularly around the house. One day, he got into a fight with the neighbor dog and, after a few hundred dollars in vet bills, I decided that enough was enough. My family had two other dogs in Sit Means Sit training and recommended that I bring my dog to them. The classes at Sit Means Sit are far more engaging and creative than what I found at other training courses. Michael and his team work hard to keep drills fun and interesting. Classes are varied enough that, even after a full year, my dog and I still enjoy every week. At the same time, the classes are flexible, so if there is a week that I cannot attend, I never feel behind the group when I return. Thanks to Sit Means Sit and their fantastic team (and some hard work), I now have a happy confident dog who goes to day care, plays at the dog park, and goes running with me OFF LEASH!!! I never would have imagined that this training could help my dog as much as it has and I recommend Sit Means Sit to anyone who wants to better train their dog and is willing to learn how to be a better dog owner/handler. Michael and his team have been a godsend to our crazy lab puppy! One of the most impressive aspects of their training programs is the fact that they are always there for you, even after the training program is completed! No matter how big or small the training issue, they are aleays there to help guide and teach both you and your dog. Michael and his team really take the time to teach you, your family and your dog. This space isnt long enough to say how wonderful they are. Dog went through their 21 day board and train and came back completely changed. Exhibited food aggression and territorial tendencies. Now he is the complete opposite and all other bad habits have diminished as well. They saved our family, and I am forever grateful! Michael and the other trainers are extremely knowledgeable, caring, and responsive. They’re very patient with the dogs (and humans) and are happy to deal with any concerns or fears that exist. I couldn’t be happier and my dogs are making wonderful progress because of the work they’ve done with them. They have worked their magic on our big German Shepherd puppy , Schroeder. Michael was fantastic to work with and taught me so much about how to help him fit in our family. Even when scheduling problems popped up they always were willing to work with me. Absolutely the best and all our dogs will be graduates of sit means sit! Michael and his team at Sit Means Sit have greatly helped my family understand how to communicate with our dog. We are able to help our dog understand what it is that he should be/or shouldn\\\’t be doing and this helps him be a calmer, less stressed out dog! The people at Sit Means Sit are great! They can work with any dog quickly and \”kindly\”. Michael and his staff at Sit Means Sit Southern Raleigh are amazing! They give both the dog and owner the time and attention needed to succeed! I started with Sit Means Sit when Bruno (German Shepherd) was about 4 months old. In a year and a half, he has become one of the best trained dogs I\’ve ever seen, from the use of his basic commands in high distraction environments to advanced commands and off leash control. If you want a well trained dog and a super bond with your dog, Sit Means Sit Southern Raleigh is the place for you. Sit Means Sit taught us how to communicate with our dog! I recommend them to all of our family and friends! Sit Means Sit is amazing. Michael is an excellent trainer! We could not be happier with our experience with Sit Means Sit. We sent our 16 week old German Shepherd puppy and were so pleased with the results and the training that we sent our 4 year old Vizsla too. Michael answered all our questions and Ben and the trainers are great. Very pleased! You can’t go wrong with this team. They’re fantastic trainers and will be able to help you with whatever needs you may have! I am a fan of Sit Means Sit Southern Raleigh best pet service because of how dedicated and flexible they are to working with you and your dog. I attend their classes regularly and the trainers are wonderful and always have great tips. The use of postive reinforcement to help coach your dog through their fears has been life-changing to all the dogs and dog owners I’ve seen stick with the program regularly. Sit Means Sit teaches you ways to build trust between you and your furry friend and offers practical advice to ways to continue working with them at home. I would reccomend them to any dog or dog owner, especially those who think their dog is being aggressive or fearful. Sit Means Sit creates happy and healthy dogs and owners :). I’ve known Michael since he first discovered Sit Means Sit, bringing his dog in for training. From the very beginning, he was a natural trainer!! I watched his enthusiasm grow as he learned the Sit Means Sit methods and as he attended national training seminars. Not only is he a great trainer, he is a great human being. His understanding, compassion and empathy for others allows him to work with people and animals in a way that is individual to the needs of each person/dog. His upbeat nature infuses self confidence into the people/families that he works with, allowing each to reach their training goals with their pet. In the years that I’ve worked with him as a trainer, I’ve never seen an interaction where his clients have felt anything other than empowered. Michael’s humility and expertise have guided him to hire an amazing staff. Ashley helped my son’s girlfriend with my son’s dog. She, my son’s girlfriend, went from feeling completely unsure, to being happy and excited about group class. She now can take my son’s dog anywhere, on her own, and feel confident doing so. Ben has been working with my foster dog, who has many emotional issues, and he treats her like his own dog. He is SO loving, SO patient, and yet has conveyed to her that he is taking care of everything and she doesn’t have to be in charge. I’ve worked with a number of different trainers, with my various dogs, over the years and currently have three family dogs, plus my foster, enrolled at Sit Means Sit of Southern Raleigh. I can say that, in my experience, you would be hard-pressed to fine more knowledgeable, compassionate trainers in the Triangle. Kudos to Michael and his staff!!!! These guys are the best!!! Super fast and effective training! Sit means Sit helped my dog be a part of the family. I loved the results so much I decided to change my career path and persuse dog training. 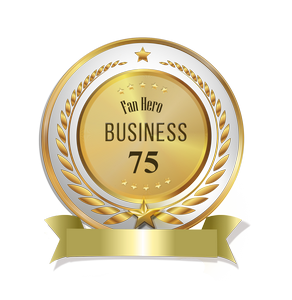 I opened my own franchise two years ago and could not be happier! We were desperate to have our rescue boxer be able to mesh with the family, but he was having a very difficult time. We had tried other training through the pet stores, and saw no improvement. After a 5 day board and train, he was a different dog. We still have some growing pains as a family to work out, but with the continuous ongoing training, I know we will get there soon. This was a lifesaver, and was able to keep our new family together! I wad able to pick the perfect program for my dog and see such success! Staff is awesome and easy to contact whenever I have questions about training. Very happy!! Sit Means Sit did an amazing job with our lab puppy. They taught her to listen and she loves to work and do what she was trained. She does great out and about around people and other dogs. We always get complements on how well she behaves. I can not say enough about Sit Means Sit Southern Raleigh. Our lab mix puppy, Remi, was a hand full. We decided to do the 5 day training and we picked up a different dog. We can’t say enough about Michael and his staff and how much better our Remi is now. People comment all the time about Remi’s behavior and we always recommend Sit Means Sit Southern Raleigh. We are so happy with how Remi did with his training. Sit Means Sit is hands down the best place to take your pets. We have two very sweet girls but they fought each other and we couldn\’t bare to see them get hurt anymore. Either something had to change or we were going to have to find one a new home. Michael helped us learn how to control their dominance and teach them that we\’re in charge. Now we have a peaceful home and two happy, well behaved pups. Everywhere we go people ask how our pups are so well behaved and I tell them to call Sit Means Sit Southern Raleigh! Sit Means Sit allowed our family to stay together. Sit Means Sit (South Raleigh) gave our newly acquired 2 1/2 yr old rescue, Dixie a much needed “tune up” on her walking and obedience skills. Her 3 full day sessions did the trick as she is now much calmer on walks and in the house as well. We’re very satisfied customers! Sit Means Sit taught my dog to control his dog reactivness & to put his trust in me. now we can go on walks and runs where I am in control & it is so much more fun!!! This training has made our lives so much better!! Sit Means Sit dog training has done great things for my dog! Their staff is always so professional, kind & very helpful in every way! I would recommend Sit Means Sit to anyone! Michael and his team are phenomenal. Our dogs needed a lot of work, but they were patient, caring and gave us excellent training to get our 2 pups on the right track. Now we’re all calm on walks and in every-day situations. I highly recommend Sit Means Sit. Michael is an excellent teacher and is passionate about what he does! SMS rescued my rescue dog. I adopted a 2 yo English Shepherd/Border Collie mix from the Louisiana floods. He had been shot (the bullet is still in him) and was left for dead during the floods. He has a lot of trauma and is high strung, nervous, and was very difficult to train. SMS kept him for 3 weeks and he came back a different dog. They are the real deal! We had our lab trained here for the maximum time while we were on vacation. They texted me and kept me updated regularly sending pics and giving me progress reports. She was a different puppy when we picked her up! She nailed every command!!! We were so happy with her at home and enjoyed her much, much more. They did an awsome job!!!! Best decision ever!!!!! Sit Means Sit dog training is fantastic! I have a dog named Derby( he is a Whippet). I called him demolition Derby.He loves people and greeted them by jumping all over them and scratching them in his exuberance. Very annoying.He reused to come or sit on command.He loves people,but people did not like him jumping all over them. One week boarding and training cured him of his bad habits. I now have a dog who listens and I am developing skills with training to help him continue his improvement. Follow up is key.Kudos to Michael and his crew. Sit Means Sit Southern Raleigh and the entire staff have been more than helpful for our pup. They’re more than just dog trainers, and put in tremendous amounts of time and effort to ensure they’re training us and our (crazy) lab. The board and train, ongoing group classes and continuous support has been great in teaching our dog manners and helping him overcome fears. I would highly recommend Sit Means Sit to any dog owner. Michael and his staff at Sit Means Sit have been wonderful to work with. Would highly recommend this business to any dog owner who wants a happy, well-behaved, social dog. This really made a difference for our boxer puppy! Our little pup, Jenny, is a Fox Terrier and is very active and aware of her surroundings. Unfortunately, her reactions to other dogs and people are not always very positive. SitMeansSit has made a world of difference to Jenny. Michael and Ben have worked very hard with us and Jenny to make a huge difference. They are so friendly, loving and again positive with her training. They are top notch in our mind! Jenny, also, just loves working with them and being in their classes. SitMeansSit is the BEST dog trainers in our book!!! Sit Means Sit is awesome! They took my adorable but unruly and badly-behaved boy dog and made him a star! Sit Means Sit southern Raleigh has changed my fur baby’s life, he pays attention to me and knows what to do. The staff at Sit Means Sit were AMAZING and the owner worked with me on my issues and concerns. Cannot say enough good things. They do such an AMAZING JOB with all the dogs! They have passion and patience with each individual furry friend . Best dog trainers around – period. Sit means Sit -southern Raleigh was the best decision we have ever made! Our pup is the happiest he\’s ever been and the training WE learned too has helped to continue what sit means sit instilled. The group classes are an even bigger bonus that you must attend to build on the foundation and maintain an obedient pup. THANK YOU Mo and staff for a life changing experience! Sit Means Sit and their entire staff are fantastic. They really know and understand how to help you and your dog. They cater their training to your needs and teach you how to implement training into everyday life. I wouldn’t go anywhere else. Our dog was extremely anxious and they helped him by the confident happy dog we always knew he could be. We can’t think them enough. Sit Means Sit has helped me so much with my St. Bernard! When we started training, I struggled to control my 150 lb. pup because he wanted to kill all people. Now after training, he is sweet with all people and loves to go out in public! I have heard stories from satisfied customers. I also have seen the tireless effort put in by the employees. I came to Sit Means Sit after a series of disappointing, discouraging attempts at training other places. My rescue dog Maple is extremely reactive to other dogs and fearful of new people/things; I’ve tried so many strategies to try and address these concerns but nothing worked at all until I started partnering with Michael and Ben at Sit Means Sit! Over the past few months, Maple has steadily made progress – as have I, as a dog owner – and I am encouraged every day that I work with Maple by how we grow and learn together! The staff at Sit Means Sit have helped me develop a better understanding of my dog – and weirdly/surprisingly myself! Michael and Ben genuinely love working with dogs and helping owners; they understand dogs, have good intuition, and are great at building confidence in hesitant owners and unsure dogs. I can’t recommend them enough! Without Michael, my rescue would have had to find a new home for the fourth time in his life. Now he’s my best friend and the life of the party everywhere he goes! He helped me gain full control over my crazy pointer and I couldn’t be more thankful. There’s still progress to be made but Michael has helped us every step of the way. Michael and his team are the bomb!!! Our Lab mix attended training with Sit Means Sit for 15 days. He returned to us a much calmer, more well-behaved dog. He has continue to be very obedient. His anxiety level is so very much better and we are amazed. We are so appreciative of the work these wonderful folks did. I get to witness daily the success of Sit Means Sit. My Schnauzer was lacking focus. Michael knew how to handle and made our sweet pup a better dog and us better dog parents. I highly recommend Sit Means Sit Southern Raleigh. We NEVER thought our German Shepard would ever listen to us until we brought him here. In just a short few days he did a complete 360!! It is amazing! Highly recommend ! The Southern Raleigh chapter of Sit Means Sit has transformed our dog Jack, a boisterous Labrador, into a wonderful citizen. Jack had issues with other dogs, the family cat, and general “good boy!” manners. Michael and his team worked with our buddy and taught him (and us!) how to be a part of the pack. Note to future clients: training starts with SMS, but it’s up to you to continue the training at home! Highly Recommend. -Eric K. and Jack the lab. Sit Means Sit is a great place to bring your dog with any issues. They are very willing to help whether it be issues with anxiety, aggression or just basic obedience. And once you finish a program you have group class for life! Great training and great people! They offer free evaluations too!! Amazing training and amazing results! Sit Means Sit is awesome!! Great customer service, great training! They really care about the dogs and the people they are helping. These folks get results….. I have seen the results of their training with two very different types of dogs. The first one was a seemingly vicious dog that seems to now ive to perform his \”tricks\” and please his owner. This dog is not only loving to his owner, but to small children and other dogs as well. The second dog is a small one with a young child in the household. Best dog trainers around. They really help you understand your dog better and how to have a better relationship. These guys are always just a call away and genuinely care about your dogs well-being, I cannot recommend them enough. Sit means sit southern Raleigh is the best place to bring your dog for any kind of training. The team is very dedicated and knowledgeable. I them recommend to any dog owner.